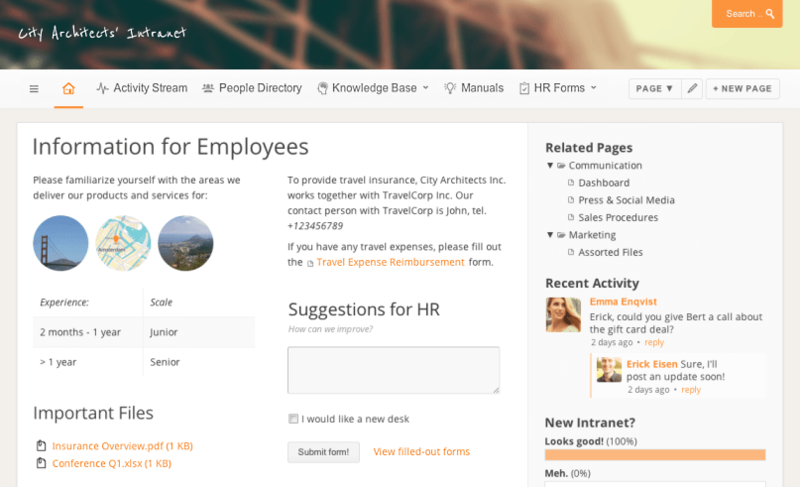 Dream up an intranet with drag & drop and work better together with colleagues or clients. Easily share and collect information, files, discussions, online forms, notes, and much more. Just drag & drop, super easy! Share notes, files, images, wiki-like documents, forms and more with colleagues and clients. Add custom online forms in seconds. Use reports to view your data and process requests. Keep all your team's information and documentation in one place, safe and secure. Find it back instantly with powerful search. Keep track of updates, comments, and people. Follow progress, have discussions and post ideas with a social intranet. "makes intranets and wikis cool again"
"a new idea for intranets"
Papyrs offers a modern, intuitive intranet solution to streamline and organize your company's work flow. No technical knowledge or costly consultants required. Use our flexible editor to create pages or even design forms. Build your intranet without programming or code, just drag & drop! Secure access from anywhere, any time. Whether you're on the road, at home or at the office: you only need a web browser to access your online intranet! Nothing to install or maintain. Papyrs is fully hosted, safe & secure. That means you don't need to worry about installation, configuration and maintenance. Simply focus on your work! Great Support. We listen to our users, and love to help you out with any questions you may have! Risk Free Trial. Want to give Papyrs a try? Sign up now for a free 15-day trial, no obligations. We love making software simpler. We design everything with you, the end user, in mind.